“James Hampton's Masterpiece of Folk Art.” Guideposts, 27 June 2017, www.guideposts.org/better-living/life-advice/finding-life-purpose/james-hamptons-masterpiece-of-folk-art. A janitor sweeps up the loose scraps of paper and trash dropped by the business men and women. Heads bent, they are too involved in their work routine to notice as he pockets a loose bit of aluminum foil discarded thoughtlessly from someone’s lunch. That evening, he goes directly from work to a rented storage space before even changing out of his uniform. From his workman’s pants he pulls out a handful of gold and silver foil, along with some string and a piece of carefully folded cardboard. Using the found bits he collected from his day, as well as other scraps donated by friends and family, he carefully constructs a small glittering crown, which he places next to four more assembled crowns. He works late into the night, adding glittering foil here and there, molding and remodeling the malleable material into different shapes until the forms finally sit just right. He mutters to himself as he hastily writes notes in a codified language. This offering is for God, so it must be perfect. This was James Hampton, a self-taught African-American artist, who worked as a janitor by day and slowly built a towering throne room by night in the 1950s. Hampton spent fourteen years in a rented carriage house constructing The Throne of the Third Heaven of the Nations' Millennium General Assembly, or The Hampton Throne, using gold and silver foil, cardboard, and other found materials. Neither friends nor family knew about his creation until after his death, when his storage room was opened and a throne room comprised of hundreds of individually sculpted pieces was discovered. Careful instructions on how the room was to be displayed, as well as informational diagrams left in the space, helped modern museums known how to go about showcasing Hampton’s work. Besides the central throne there is an offering table and multiple alters, pyres, and crowns that comprise the full work. At the center of the composition sits a huge throne, layered with foil and cardboard of alternating color and decorated with wings and stars. The words “FEAR NOT,” molded in silver foil above the head of the throne, allude to the frequent use of the phrase “fear not” by God when he addresses His people. Isaiah 41:10 reads: “Fear not, for I am with you; be not dismayed, for I am your God; I will strengthen you, I will help you, I will hold you up with my victorious right hand.” Hampton was a deeply religious man and heard the voices of angels instructing and guiding him throughout the creation of his throne room, his way of preparing for Christ’s return. Prominent wing motifs directly reference this angelic intervention and holy influence on the work. As he spoke with the voices Hampton would record their messages on paper as well, which he kept in a journal. Though the book was also found in the storage facility and is with the artwork today, it is written completely in a spiritual language unique to Hampton that has yet to be deciphered. Tags and notes made of cardboard and string affixed to various alters also feature this mysterious language. The work is almost perfectly symmetrical, as objects on the left are meant to represent the teachings of the Old Testament and Moses while those on the right refer to the New Testament and Jesus. The Hampton Throne showcases the typical splendor and golden glittering drama frequently found in Christian art, yet has an inherent humbleness due to its construction of found materials. Hampton himself embodies this spirit of the humble devotee. His throne room expresses not only his profound spirituality and faith, but carries a message of love and acceptance that he clearly felt from God and wanted to share with the world. Though he never had the chance to personally show this work of art to the public, as he died before its completion, his message lives on: FEAR NOT. 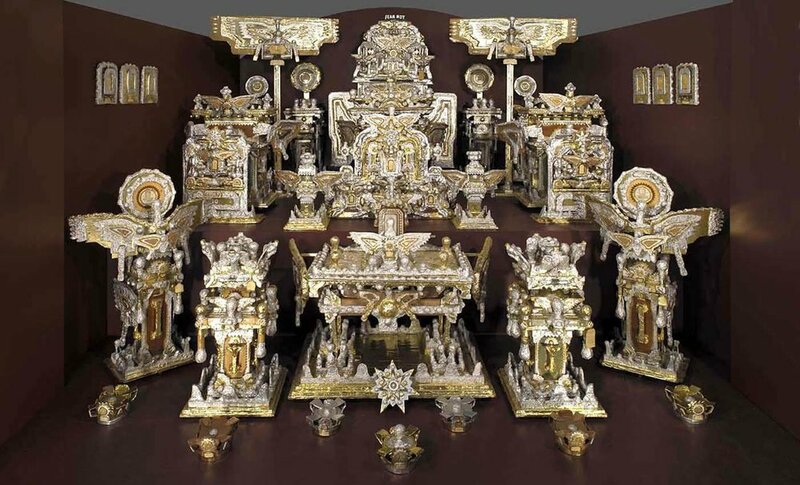 “NCPTT | James Hampton's Throne of the Third Heaven of the Nations' Millennium General Assembly.” National Parks Service, U.S. Department of the Interior, www.ncptt.nps.gov/blog/james-hamptons-throne-of-the-third-heaven-of-the-nations-millennium-general-assembly/.